But this isn't the first headset we'd choose for music listening. ONvocal is a tempting Bluetooth headset for Amazon Echo addicts like me. I sometimes need to stop myself from instinctively summoning Alexa while I’m out and about. Not that you need to own an Echo smart speaker to use the ONvocal (OV). Like Logitech’s car-based ZeroTouch, once paired with your smartphone, this headset will summon Amazon’s digital assistant from anywhere, provided you have an Internet connection. Don’t care about Alexa? Touch a different button, and you can query Google Assistant from your Android phone, or Siri from your iPhone. But the OV’s profusion of buttons—seven in all—present a steep learning curve. Admittedly impatient, I found this frustrating in my early time with the device. I grew accustomed to them with time, but not with some of the OV’s other idiosyncrasies. More on those later. It might take you a while to memorize the functions of the six butttons on the ONvocal's neckband. 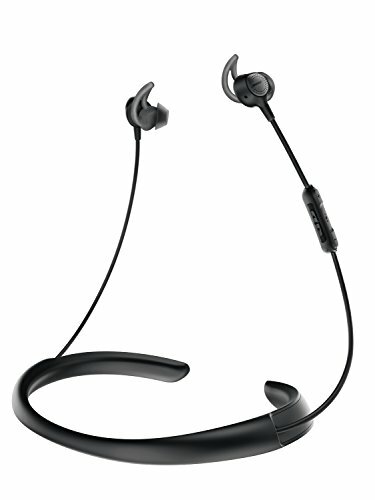 Like some other headsets that have a proliferation of electronics—Bose’s noise-cancelling QuietControl 30, for instance—the OV have wired earbuds attached to a neckband. In case you were wondering, the OV doesn’t perform noise cancellation. There are three buttons on the left side of the neckband, three on the right, and one on the right earbud, from which the mic stalk emerges. 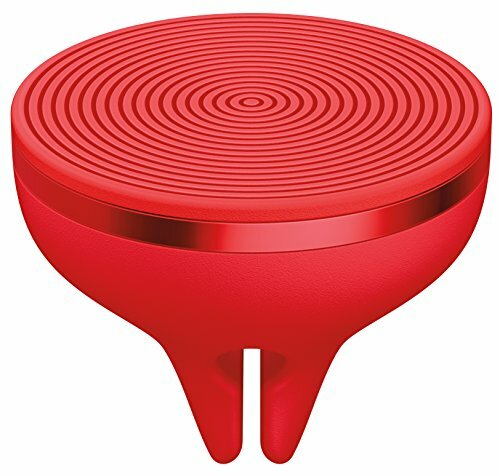 The rubberized buttons take a bit of finger pressure to activate, but most of them respond quickly. That’s not true of the button that summons Alexa. That one, at the back of the left neckband, is also used to power the headset on and off, so don’t hold it down too long. Push and release it, and you’ll need to wait 2.5 to 3 seconds before you’ll hear the beep that indicates Alexa is waiting for your command. Unlike with an Echo device, you don’t have to utter “Alexa” ahead of your request. If you’re listening to music when you press the button, the music will pause and then automatically resume after you’ve told Alexa what you need (it will also resume within a few seconds if you don’t say anything). The same thing happens if you summon Google Assistant (I don’t have an iPhone, so I didn’t try the headset with Siri). I found it hard to avoid touching the button on the right-hand earbud when pushing it back in my ear (do that on a call and you'll hang up). Pressing some of the other buttons results in even more helpful audio cues—a female voice informing you that the headset’s state has changed. Pressing the first button on the left-hand neckband, for example, activates an ambient/chat mode that pipes sound from the mic into the headphones. This makes it easier to be more aware of your surroundings or to hear someone speaking to you in person. The middle button turns voice mode on and off. 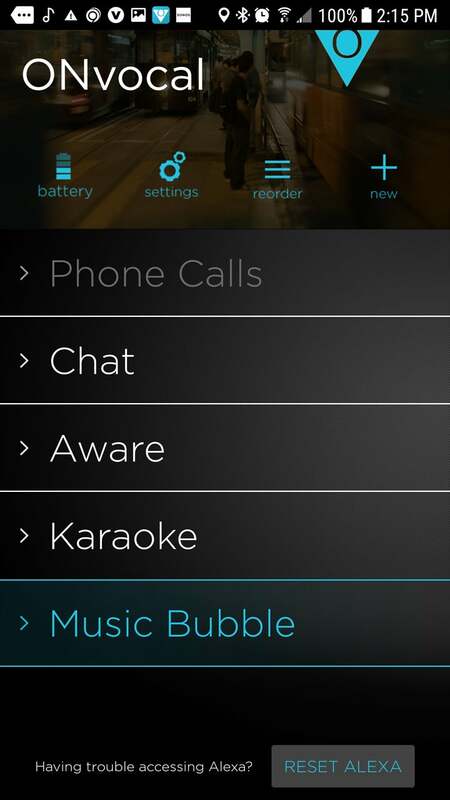 With this setting, you can hear you own voice through the ear buds, so you don’t yell when you’re speaking out loud. Disappointingly, however, neither ambient nor voice mode pause or turn the volume down if you’re listening to music. You’ll need to press either the first button on the right-hand neckband to pause the music, or press the button behind that one multiple times to lower the volume. As with many higher-end Bluetooth headphones, the OV support the aptX codec to deliver better-than-average audio quality over Bluetooth. I’d be even more impressed if they supported aptX HD, but that would probably drive the cost even higher than the already steep $299. Voice quality was very good during the calls I made with the OV and a Samsung Galaxy S6 Active, and the people on the other end of the call said my voice came through crisp and clear. The connection to your phone is wireless, but wires tether the earbuds to the neckband. Despite its use of balanced armature drivers, the OV’s musical performance wasn’t quite as impressive, with most of the deficiency coming in the bass department. Listening to John Hiatt and the Goners’ “Almost Fed Up With the Blues,” from Beneath This Gruff Exterior (which I’d ripped from CD and encoded in FLAC), Hiatt’s vocals and Sonnny Landreth’s slide-guitar work came through fine, but Bobby Keys’ excellent work on the baritone sax just faded into the background. This headset wouldn’t be my first choice for music listening. The ONvocal app lets you choose between five EQ presets. 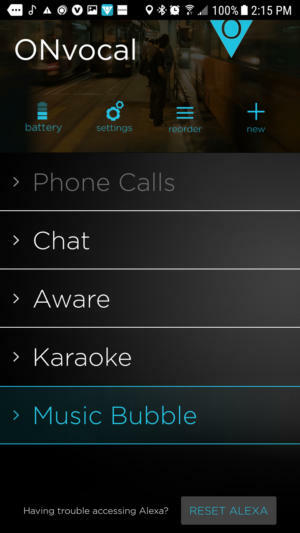 ONvocal developed an app for this headset whose primary function is to let you switch you between five EQ settings: Phone Calls, Chat, Aware, Karaoke, and Music Bubble. You can customize each of these to your preferences, but it’s highly impractical to pull up an app before or during a phone call. As for Karaoke? Pfft. I fiddled with the app a bit when I first started using the OV, but didn’t pay much attention to it after that. The thing is, the app must be running to use the OV’s Alexa connectivity. I did find it useful for one thing: It reports the headset’s battery level. ONVocal claims the battery should last eight hours with continuous calls and music, which seems about right. You can extend the battery life by plugging in the provided cable, which automatically turns off Bluetooth. 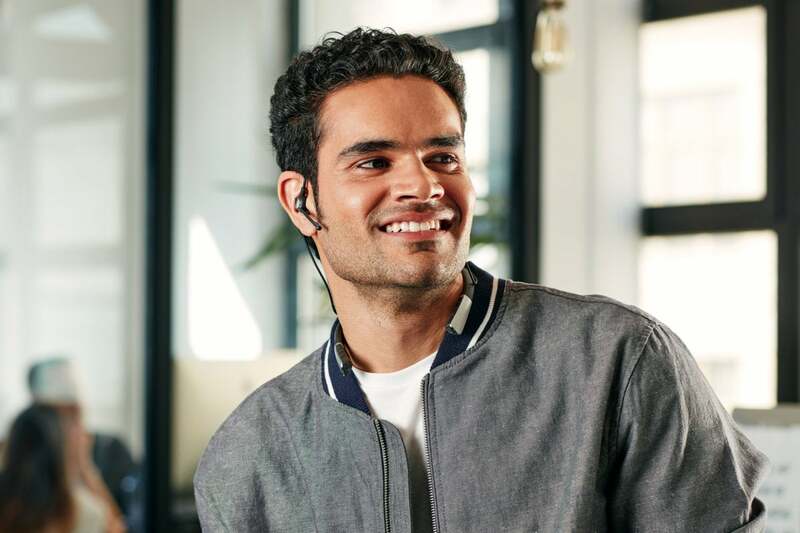 A neckband is a necessary evil if you want a headset that does more than just play music and enable phone conversations—the extra electronics need to go somewhere. I found the OV’s to be comfortable enough to wear with both collared shirts and T-shirts. It was easy to forget it was there when I didn’t need to manipulate its buttons, provided I was relatively stationary. 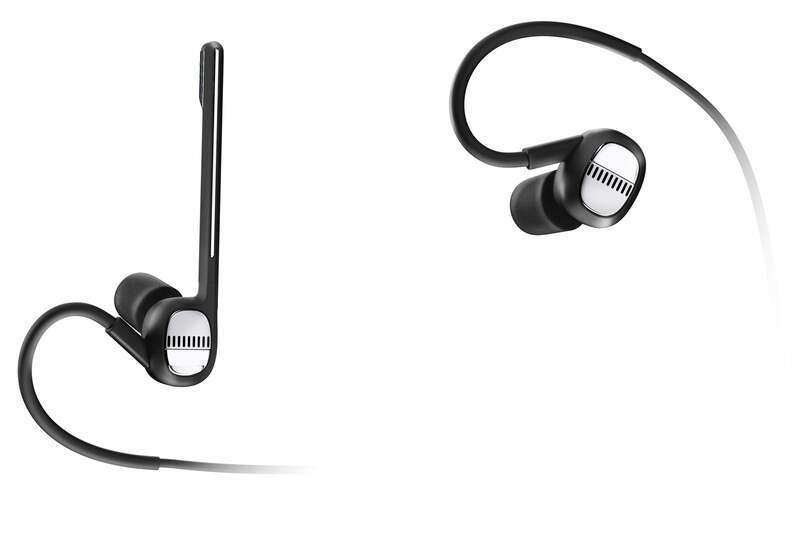 If I moved around much, the neckband would slide around and eventually pull out one or the other earbud. When it was the one on the right, where the mic stalk is mounted, I’d nearly always end up inadvertently pressing the multi-function button there while trying to shove it back into my ear. That would instantly terminate any phone call I was on, or it would interrupt my music to awaken the Google Assistant if I wasn’t on a call. ONvocal provides three sizes of silicon ear tips, plus one pair of Comply brand memory-foam tips. Crush these before inserting them in your ear canal, and the foam will re-expand to fit you almost as well as a custom-made set. That’s a nice little bonus, though I’ve long been spoiled by my custom-fit JHAudio JH13Pro to want to listen to music through anything else. The lined hard-shell carrying case with a magnetic clasp is another perk: It will protect the neckband and prevent the stub cables from getting tangled with anything else you might stuff in your backpack. ONvocal’s OV headset isn’t the first product I’d grab for a music-listening session, but I suppose that’s a secondary function anyway. Its primary role is to handle phone calls and to provide you with access to your digital assistant of choice. And it fills that role nicely, as long as it’s within proximity of your phone and you have the app running (and consuming your phone’s battery). I’m a heavy Alexa user, with six Echos distributed around my home controlling more than 90 smart-home devices. I also use it for shopping and to-do lists, setting reminders, getting weather and traffic updates, and lots more. So being able to access Alexa on the go—or even when I’m just out in the yard—is a big plus. 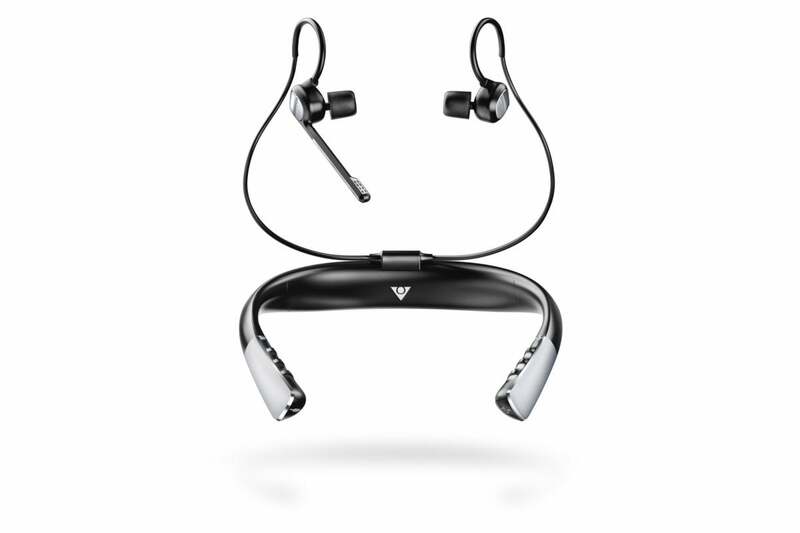 But my enthusiasm for the OV is tempered by the headset’s price tag and its propensity for moving around my neck when I’m on the move. ONvocal’s OV headset is more advanced than most, with an ability to summon Amazon’s Alexa being its strongest feature. Music reproduction, on the hand, is easily its weakest.